[UPDATE 21-JUL-2018 06:37 UTC: Some say that the Copts have renounced their Monophysitism, pointing to an alleged 1988 common declaration with the Novus Ordo Sect. Apparently they claim to be "Miaphysites" instead. We apologize if we have unwittingly distorted precisely what Copts believe, but the main point of this article remains valid: The Vatican has permitted a heretical-schismatic sect to conduct its public worship in a Catholic basilica, and that is a grave affront to Almighty God and a scandal to souls. Whether or not the Copts are still Monophysites, they are definitely not Catholic, as they deny the dogma of papal primacy, for example.] The apostasy of the post-Catholic Vatican is becoming more and more obvious by the day. Although the Modernists have long defiled our Catholic churches with their dreadful Novus Ordo worship service, they have always done so under the label of "Catholic." But now the time has come when even worship that explicitly calls itself something other than Catholic (namely, "Coptic Orthodox") is being permitted in (formerly) Catholic churches. 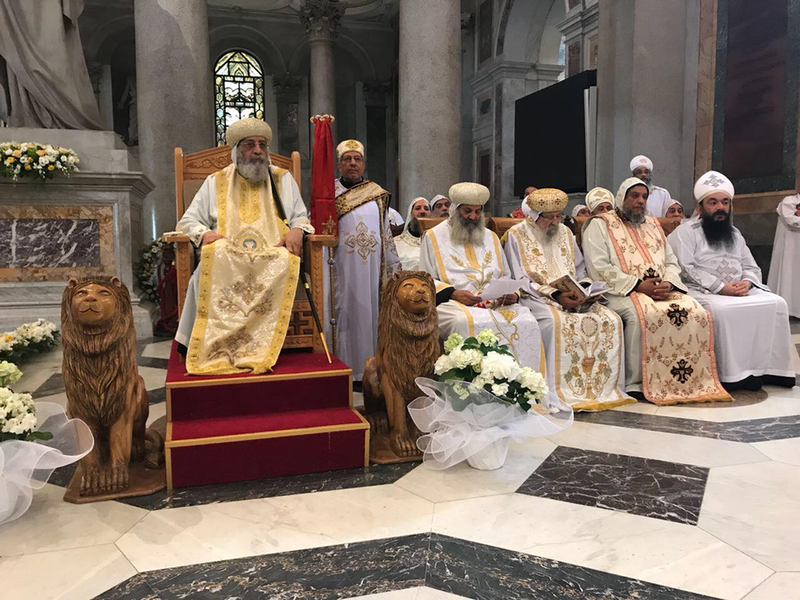 This past July 8, with the full permission of the Vatican under "Pope" Francis, the head of the so-called Coptic Orthodox Church, "Pope" Tawadros II of Alexandria, offered Holy Mass in the historic Basilica of St. Paul's-Outside-the-Walls in Rome. This had been announced beforehand but apparently didn't raise a single eyebrow. And why should it, after Francis ordered an Evangelical-Episcopal layman buried as a Catholic bishop? Why should it, after the "Pope" said Catholics could go to Anglican "Masses" whenever no Catholic Masses are available? Why should it, after Anglicans were permitted to have a Vespers service ("Evensong") in St. Peter's Basilica in Vatican City last year? Reports of the Coptic Mass at St. Paul's Basilica have been sparse to non-existent. Perhaps it is because many Vatican journalists are on vacation, finally trying to get some rest from the nonstop Bergoglian news cycle. In any case, the Vatican's official newspaper, Osservatore Romano, did publish a blurb on it (see p. 6). The parts rendered in bold are typical errors spread by the Vatican II religion today and/or adhered to be a great number of people who believe themselves to be Roman Catholics. Yet, Holy Mother Church had long and frequently condemned these things as incompatible with and injurious to the true Faith. For example, in 1907, Pope Saint Pius X, quoting his predecessor Leo XIII, warned: "It is impossible to approve in Catholic publications a style inspired by unsound novelty which seems to deride the piety of the faithful and dwells on the introduction of a new order of Christian life, on new directions of the Church, on new aspirations of the modern soul, on a new social vocation of the clergy, on a new Christian civilization, and many other things of the same kind" (Pius X, Encyclical Pascendi, par. 55; bold print added). Is this not essentially a condemnation of the entire Vatican II religion in its foundations? Many people do not realize that a lot of the Church's disciplines and laws are so closely bound up with divine revelation and the truths of the Faith that to change them would be tantamount to changing the Faith itself. This is why Pope Gregory speaks of the "law of the believer" producing "the law of the doer." It is natural for a man to act as he believes, and to believe as he acts. Should there temporarily be a difference between the two, it will resolve itself before long, either by the person changing what he believes to agree with his actions, or by changing his actions to agree with his beliefs. This is where the New Church has been so successful in destroying the true Faith in millions upon millions: They have changed the disciplines (for example, and most especially, the Holy Mass) to agree with the New Faith, and by making people act in accordance with the new beliefs, they have ensured that they will, before long, also change what they believe, gradually and without even so much as noticing it. Perfect cases in point: Mass facing the people. Communion in the hand. Reducing the Holy Mass from the August Sacrifice of the Altar to a communal meal. Talking and dancing in church. Ridiculous clown liturgies. Marriage "annulments" handed out so lightly and numerously that they are now the de facto equivalent of secular divorce, having harmed thousands of families, esp. children. Etc. The list is endless. Who today in the Vatican II Church is still a Catholic in what he believes and professes? The message the changes since Vatican II have been sending is essentially: God is not to be taken seriously. The "Catholic" Church is not to be taken seriously. We change with the times. In short, the Novus Ordo Church has made itself irrelevant, and that is exactly what it is today and why no one in the secular world really takes it seriously. All the crockodile tears now being shed about "abuses" and desired "continuity" with the past and lost influence with the secular governments of the world, are not going to change the fact that this Vatican II Revolution was begun by and imposed from the top. Never forget this. It all began with Angelo Roncalli, "Pope" John XXIII. And it went downhill from there. All of this was no accident, however; it was by design. It was planned by those whom the real Popes always warned about as conspiring against the very Body of Christ: the Freemasons. Is it any wonder that ever since the beginning of the Vatican II Church, Freemasonry was no longer considered a threat to the "Catholic" Church? For a clearer picture, be sure to read the 1993 essay "Freemasons and the Conciliar Church" (PDF), made available exclusively on this web site with the gracious permission of the author. Also, see our post "Freemasons Support 'Pope' Francis" for lots of information. The ideas of the Vatican II revolution weren’t new in the 1960s. In the post-Reformation period, various errors along the lines of liberalism and modernism had already infected sundry innovators who were trying to introduce these novelties into the Church. These errors manifested themselves in revolutionary movements to bring the Church “up to date”, introducing vernacular tongues into the holy liturgy, changing the Mass to correspond more to the demands of modern man, adapting Church discipline to modernity, etc. The Holy See, of course, always sternly and competently condemned these errors and defended the Immaculate Bride of Christ from the snares of the innovators.